Of course, I haven't been entirely negligent in performing upgrades this last month whilst war mongering. Cannons have all been upgraded to level 10 and mortars to level 6. Over the last week or so, I've shifted focus to collectors and storages in preparation for the holiday one-gem-boost events that will be coming our way; I'll continue to work on these as I finish off other upgrades. Troop upgrades have gone well - my farming troops (barbarian, archer, giant, wallbreaker, wizard, healer) are all maxed for TH8. The new update adds the Bomb Tower; I ponied up the 10 bucks and bought the bonus pack that provided some coins, gems, and a level 2 Bomb Tower. That's kinda neat, really - the Bomb Tower comes pre-built and already upgraded to level 2. Can't beat the deal, especially since the gems alone would cost the $10. I'm taking a month or so off from my war schedule to focus on some other items. That means I'll be busily upgrading the base's various structures. As is usual for upgrade runs, all five builders and the research lab will be going fairly close to nonstop. The goal for the next month is to finish off barracks and collector upgrades, knock out the archer towers, and start the upgrade to TH9. While the TH is upgrading, I'll work on traps and walls to level 7 (purple). TH9 offers a lot of good stuff and I'll spend through the end of the year working on upgrades at TH9 before making the TH10 jump. First and foremost - dark elixir farming is typically much improved over TH7 and TH8, and there's more gold as well. The Archer Queen makes a huge difference in both farming and clan wars. 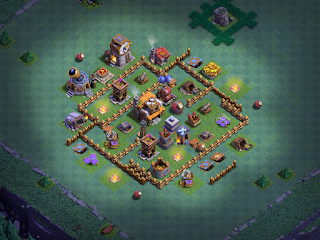 The Crows base design is one of the best out there for overall DE protection and DE becomes a focus at TH9, between heroes and DE troops. At any rate, here's the current stats.